One year two days ago, January 26, 2012, about this time in the evening (late to start anything) I decided to start knitting socks. I had never knit socks before (my mother had) and I had no actual pattern...but, I thought, I have feet, and feet will be my guide--plus various sources online and in a book I had recently acquired, Knitting Rules by Stephanie Pearl-McPhee, otherwise known online as Yarn Harlot. The hour had come--I knew if I put it off it might be days or weeks before I felt so strongly again. And so began the adventure of the Year of Socks. nbsp; My first post about it was January 28, and had a picture of a tiny frill on the needles. I've posted from time to time about the progress in knitting socks, but I thought it would be fun to do an anniversary post. Tonight (later than the anniversary due to mistakes and interruptions) I finished the ninth pair since I started...Purple One. 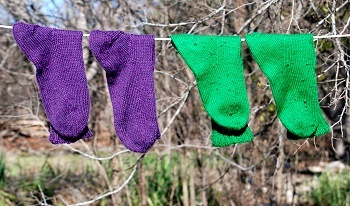 The pictures of the Year of Socks show Purple One about half-finished, on a clear sunny day last week. 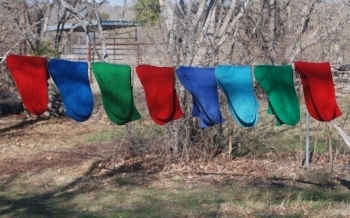 I knew from weather forecasts that it was the last day I could put all the socks outside and hope to get good photographs of the Sock Family. The first eight pairs draped over the line, in order of production from left to right. The second blue (between the second red and the turquoise) is actually several shades lighter--it was still very damp. I wear only the hand-knits now, because they're so very comfortable, which means I will have to knit a black pair to wear with my concert blacks before a Mozart mass our choir's going to sing. Somehow I suspect that any of these will manage to peek out and ruin the effect. Red One had too short a ribbed cuff, too wide a ribbed cuff, almost no stockinette between the ribbing and the gusset, no heel reinforcement, and a foot that was too big around and barely long enough. Yet it functioned as a sock, and has been worn around 100 times in these nine months--I loved the feel and wore it as soon as it dried after washing until I had knitted enough socks that it could be on my feet only once a week. Red One is now showing considerable wear (though no holes, but visible thinning of the wear areas.) Red Three has narrower, taller ribbing (I like 5 inches), an inch and a half from ribbing to heel flap (where the gusset starts), reinforced heel flap, a foot that is narrower and a bit longer--and a right and a left sock, fitting more smoothly around my toes. The order of production is L to R on each row, with the first row the earliest and the bottom row the latest. The third pair was the first on which I tried reinforcing the heel flap. The fourth pair, Red Two, lacked that reinforcement but took another two stitches off the foot circumference. To that, I added heel reinforcement in all subsequent pairs. 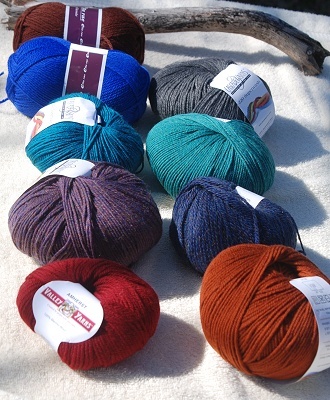 The first eight pairs were knitted with Ella rae Classic; the turquoise was also Ella rae, but Classic Superwash. All are worsted-weight, knit on US 5 needles. I like thick socks. On its second machine washing (delicate cycle, cold water) the turquoise fuzzed up and shrank a little, becoming denser. So I went back to hand-washing. It's not that hard. The purples were knitted with Cascade 220 Superwash and will get one experimental trip to the washing machine after they've been test-hand-washed. I love the color. In fact, I like a lot of the colors in that brand, so I'll be knitting more socks in it. 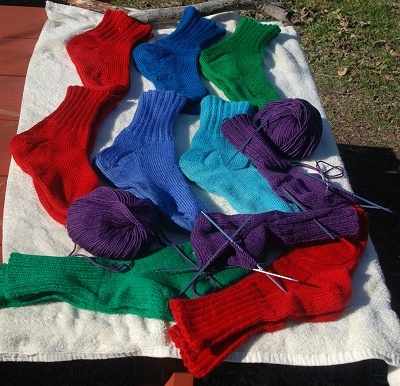 I like knitting socks (and even more, wearing hand-knit socks) and find it relatively easy. Socks are handy project to take places like hospitals and on trips. I knit them in pairs (casting on the same day, turning heels the same day, finishing the same day.) In between the days when I want to do certain bits together, they're kind of like a horse race--one sock gets ahead, then the other sock gets ahead. In terms of time, the first pair took me two months...and the eighth pair took me three...while most took about a month to six weeks, and the purples were done in two weeks. It all depends on what else is going on. Some people are faster knitters; some people have more time to knit; some people are slower knitters...and clearly my knitting speed varies from "reasonable" to "snails that slow die of old age between one rosebush and the next." Another difference is that the brighter colors of the Ella rae (Classic or Superwash) run in the wash water. The purple--which I expected to run--did not. I'll be interested in how the purples feel and look when they're dry, and also how long it takes them to dry. If they're releasing more water from the squeeze and roll in the towel, they may dry faster. The people who saw them last night at choir were impressed--everyone liked the color. It's impossible to assess the durability of these socks until a pair wears out. I hope they'll do as well as the other socks are doing. That pair of green socks was knitted in May of 2012--finished about the end of May...so it's been worn at least once a week (more, before I finished more pairs) for eight months. It's still in good shape. The next pair, Turquoise Two, now has over 3" on one cuff and 2" on the other. Again, the difference in feel is considerable. The Cascade 200 yarn feels softer and silkier to my hands, but also fuzzes up more when I need to fix an error. The Ella rae yarn is a little harsher, but tight enough wound that it doesn't fuzz when I pull out a stitch. I've never finished a pair, but that probably has more to do with my method (one at a time while I had socks to wear, and rarely wear those) than my madness, which considers every yarn purchase a good purchase as long as I enjoy the fibers. "sure, that's the only reason I ever buy yarn...more socks totally explains the hand-painted rayon lace-weight, the wildly colored cotton/silk/wool blend..."
Well, you're not going to get an argument here about the importance of beautiful yarn.... What was the question? ... The one thing I've discovered about knitting in almost three decades (that much?!?) is that you got it right right in your post: If it fits, it's perfect. There's nothing more to ask and nothing more to say than to enjoy the fruits of your labors, which, in my book, are more than wonderful! Karen, someone--and I can't remember who, but it was on LJ--suggested doing both socks of a pair at the same time to avoid the dreaded One Sock Syndrome and that made perfect sense--so I did, and have ever since. And I had to break the perfectionism that my mother learned from her grandmother in order to even start that first sock. Well done! Those all look like perfectly good socks to me - as you say, if it fits YOU, then it's right. And all lovely colours. I See No Mistakes. And you've done something I haven't tried yet, in almost nine or ten years of sock knitting - worsted-weight socks! All mine have been knitted with (varying qualities of) sock yarn/4-ply. I have got some patterns for thicker socks, but haven't tried any yet; possibly because it's rarely cold enough in the UK to need them. When I do need extra warmth I wear a pair of pop-socks (thinner or thicker, depending on the weather), with the hand-knitted socks over those. I am, cautiously, beginning to explore different sock 'architectures' - I can now do both top-down and toe-up (which I prefer - I think I get a better fit, and it allows you to use more yarn on a longer leg); I know how to do several different heels and toes; and my current pair for myself is using the "Skew" pattern (2nd pair I've made with that), which I hope will be preparation for *dramatic shudder of anticipation* intarsia in the round! Thank you. I thought about doing close-up photographs to show the mistakes but decided that only a few would be interested. As for thick socks--I was already wearing thick wool-blend socks, which I prefer for everyday wear year in/year out. But none of them really fit, and the amount of elastic they used had increased even as my aging legs thickened...so I was getting purple grooves in my legs from the compression I didn't want. In other socks, nothing really fit or was comfortable for the way I live. So..thick socks that fit and don't leave deep grooves in my legs. Yay! In our very hot summers, I found years ago that wool socks insulate my feet from hot pavement, hot rocks, etc. better than others, and also "breathe" better than cotton. Cotton socks in real heat turn into sodden set lumps--and since we go from heat outside to air-conditioning inside...this meant alternating hot feet and cold feet. Not comfortable. The wool, on the other hand, tends to maintain an even temperature for feet. So I wear them all year and have happy feet. But that's MY feet and these socks. Worsted weight for serious winter cold or very heavy use (hiking day after day) lasts better knitted on our size 4 needles, not 5s, but those socks are denser, warmer, and don't breathe as well. I'll explore other sock architectures when I have enough of this kind to let me slow down a bit, which I figure will be in another 3 years. Maybe. I've got several books on sock-knitting now, and it would be fun to try a different pattern now and then. 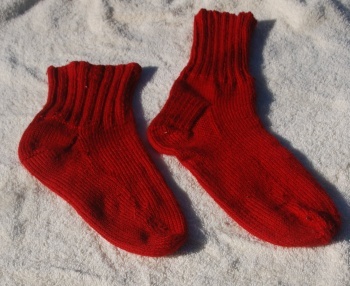 Unlike aunty_marion, I too prefer to knit socks (if I do) in heavier wool; mostly, though, I prefer bought socks for wearing, and keep the hand-knitted ones for wearing in wellies on cold days! But I have adapted my favourite sock pattern to ice-skate covers to keep my feet warm (and my boots protected) when skating! You've made incredible progress in just a year - I salute you! Thanks. If I could find commercially-made socks that fit, that were comfortable, I might not have started knitting socks with such fervor. But I can't, so...here I am, casting on another pair today. Turquoise, this time. Congratulations! As another sock knitter it's fun to look back over time at how your sock knitting has evolved (and improved!). I am now a complete snob about socks, and seem to find new balls of sock yarn wherever I go... I am a complete sucker for handdyed "luxury" sock yarn now, such as Handmaiden Casbah, Cephalopod Bugga, Malabrigo Sock and of course the incomparable Wollmeise. You'll find that yarns with some nylon in them will wear longer than just plain wool ones, too. I'm wearing a pair I knit (nylon/wool blend) about 3 years ago roughly once a week and apart from a bit of pilling they're coping marvellously. Good luck with your sock adventures! Yes, I know that some nylon in the yarn makes it wear longer, but since I knit with worsted weight, it's not as easy to find blends that are just wool and a small amount of nylon...and also in colors I want. If I can knit fast enough (and I think I can) to stay ahead of the wear, then I'm not going to worry about it. I don't have time today but will look at your yarn links when things settle down. I was able to fix that--it just went into the "suspicious comments" bucket. So here it is. Wow! Two years! Doesn't time fly. I've been impressed by how fast you progressed from Red One. It's always fun to watch someone progressing with a new skill. That's a lovely lineup of socks you've got there. I recently had to discard five pairs of socks that had been worn, darned, and had the darns wear through. I decided not to darn them again because I had no more matching yarn. And still have about 20 pairs of socks in working condition. I've been knitting socks for about 10 years now, and have some pairs that have lasted almost since the beginning and some that have only lasted 2 or 3 years. I believe they last longer only getting worn once every 2-3 weeks than if they're worn once a week. At least it feels that way. After a certain point, you reach critical mass and have "enough" socks so that you can take your time knitting the next pair. When I reached that stage I started playing with fancy stitch patterns, buying luxury yarns, and generally having fun. I always have at least one pair of socks on the needles -- they're a great portable project -- but these days I'm finding I want to knit bigger and more complex projects: sweaters, lace shawls, and stuff like that. Thanks. Yes, they definitely last longer if worn less often...I went online to find out more about sock durability (and found mostly complaints by people about socks not lasting long enough!) Apparently, in commercial socks 100 wearings is considered pretty good, and most socks are expected to last 50-100. So I figure if my socks last 100 wearings, that's one year at twice a week, two years at once a week, four years at once every two weeks, eight years at once every four weeks. Putting them into the cycle as they're made means later-made socks have a chance of achieving longer lifespans because they start with less frequent wearing. I didn't keep an accurate record of how often I wore Red One, but I know it was twice a week or more until I had seven pairs. I considered it the ugly duckling (was proud of it, nonetheless, but it didn't fit as well or look as good) so any time I needed a pair to fill in--Red One got the assignment. It dried a little faster (though in our summers, rolling the socks in a towel and then hanging them over the line would dry them in less than a day.) So an offhand estimate got me to 90 pretty easily. I remember my father darning his lisle socks - he used a light bulb as a darning egg! He must have had a very light touch...I know if I tried it I'd break the bulb and have a handful of glass shards sticking through the sock. Wow, two years already. I remember your first post where you talked about deciding to knit your own socks like it was just a few months ago. I need to learn how to crochet socks. I don't knit, never have been able to handle the two needles at once. However, I do find that the socks I buy wear out in the heels way too fast and they also leave indentations in my legs. So, if I want socks that are warm, fit well, don't leave indentations, and don't wear out so fast, I will need to make my own. Love the yarns. I have to watch the size of my stash because I don't have the space to store them. I have trouble doing crochet, so I completely understand not having a flair for both (though my mother did. She could do everything but write books.) About all I can do with a crochet hook is pick up dropped stitches and weave in yarn ends. Space to store stash? Bwah-hah-hah-hah-hah....it's, um, growing like a pumpkin vine and has already exceeded its alloted space. *chuckles* I cheated. I have a "project bag" that I keep some yarn in. Usually it is full of yarn for two, three, or four projects but only because I do work on several projects at once. Since I shuffle the yarn around my husband doesn't always catch on to the fact that when I swap out yarn for projects I mysteriously gain a bag or two of yarn. However, I wanted to get an actual crafting center set up in our new place so as I organize each room I've been collecting all my yarn in one spot and he's noticed it seems like more than he remembers it being. I tell him it's his imagination but I have stopped buying yarn for now. Of course there's also the bags his mother gave me because she doesn't make much any more. And the yarn my best friend gave me because she decided she didn't want it after all. And the yarn my daughter got so I can make her a top for summer. But I didn't any yarn. Hehehe. Wow! 18 socks in 12 months. I'm impressed. And enjoying your choice of colors. If the proper fairy dust sprinkles my hands to make knitting viable (can't maintain even tension, makes me nuts), SOCKS are what I'll make. Socks that fit are hard to find, & expensive. And not necesarily in colors I'd choose. You have all that now. Brava! It takes some people longer to develop even tension, just as it takes me longer to learn a dance. (It took me longer to learn to march in step, too.) What helps is (and you knew I would say this) knitting more. Somewhere between "I think I'm getting the hang of this..." and "HOW many more rows? this is so dull, just this knit-knit-knit..." the stitches smooth out and achieve adequate even tension. Usually. The universe has an exception for everything. I hope the fairy dust arrives for you, because the fit and comfort are paramount but having the choice of colors and patterns is...bliss. Congrats on the first year and I'm glad you have happy feet. I ran across this quote today and it seems to epitomize you.